It’s time to go East! After five rounds of West Coast racing, the first venture into the snowy East Coast is upon us. It’s a bit strange that the area with the worst weather will offer the best racetrack (outside of Glendale), but that’s the upside of a dome. Last year’s blizzard was a complete disaster for everyone trying to travel to and from the event, but the racing was great. It’s going to be cold but hopefully the snow stays away and the event is smooth overall. I am interested to see how the dirt shapes up this weekend. Minneapolis has been frozen for a month or two with temperatures reaching -40 degrees. That has to take a toll on the soil but exactly what effect it has is yet to be seen. Was the dirt exposed to the snow? How early did it get brought inside? I am also curious to see what measures the crew takes with any drying agents if the dirt is indeed wet or frozen. After last weekend’s issues, I doubt they will be allowed to use much of anything. All of that could contribute to a very rutty Minneapolis racetrack. The start in Minny is great. It’s long, wide, and has the best variation of first turns. There will be room for riders to maneuver and the inside and outside gates will both have a chance. The first rhythm could get dicey, though, as there are a few big combinations to put together. This layout shares many similarities with Glendale and this first section is one. I believe the most common line will be 2-3-3 but I think we will see riders like Justin Brayton, Dean Wilson, and Blake Baggett try some more creative options. If they can throw in a wheel tap or change the rhythm, they might be able to make time or passes here. The next 90-degree left leads into a dragon’s back and onto the mechanics’ area, which crosses the start. That blasts into an open 180, another Glendale similarity, and back across the starting line again. A 90 right leads to a rhythm and I believe riders will cut across the inside of the corner and then go 2-3-2 into another 180. The only whoops section is up next and I expect these to get broken down significantly. 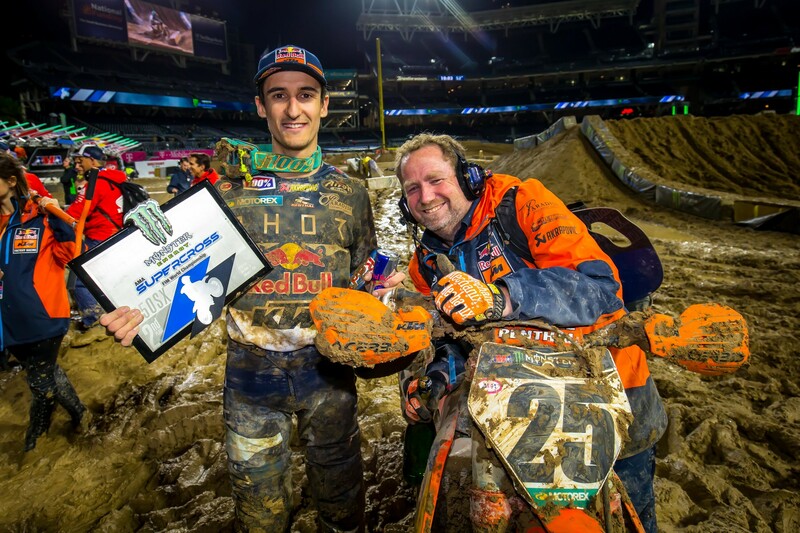 The fastest line in the main event could very well be to jump through these so watch for Marvin Musquin and Cooper Webb to test the waters several times. Musquin is lethal when he can put a line together that allows him to jump in and jump almost out of the whole whoops section. Riders will careen back down the start straight and into a 180 before the finish line jump. I would anticipate block passes in both the 180 exiting the whoops and also just before the finish. There is a small double after the finish and into a flatter 180. The next section is interesting and has two options. First, riders can hop the small double and then 3-3 or even 3-2-1 if they want to stay inside in the following corner. 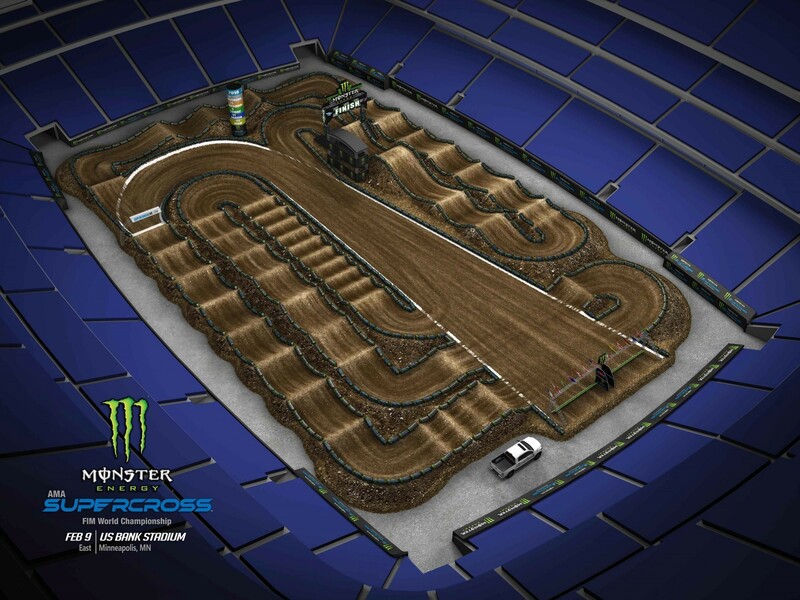 The more interesting option would be to wheelie the small first jump and then double across the gap, then go 3-2. That would allow them to stay lower and faster through the section. How the jumps are built, ruts, angles, etc. will all dictate this. The final section is identical to Glendale with a standard supercross triple into a flat 90 left and back onto the first straight. What’s the end game for lime-gate? Was San Diego the beginning of a Tomac run? Who will fire the first East Coast 250 salvo? Does Cooper Webb bounce back? Can I survive in -17-degree weather? What’s the record for coffee consumption in one weekend and can I break it? 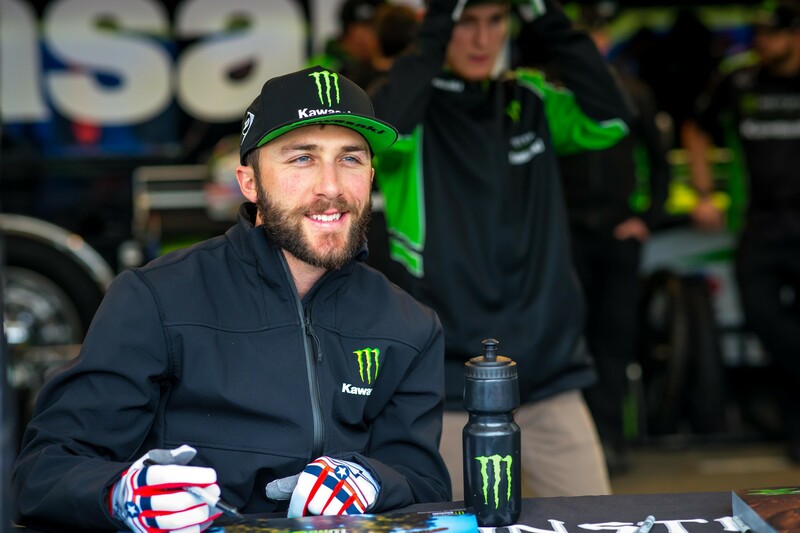 The usual suspects of Eli Tomac, Marvin Musquin, and Ken Roczen rose to the top last weekend. Justin Bogle looked to have a podium spot locked up but a heroic last couple of laps put Musquin past him and even ahead of Roczen at the checkers. Chad Reed is opportunistic, using his mud skills to jump up to fifth on Saturday. Monster Energy/Pro Circuit Kawasaki went 1-2 in San Diego and have two of the title favorites entering Minneapolis. Several riders’ private areas after a challenging San Diego event. 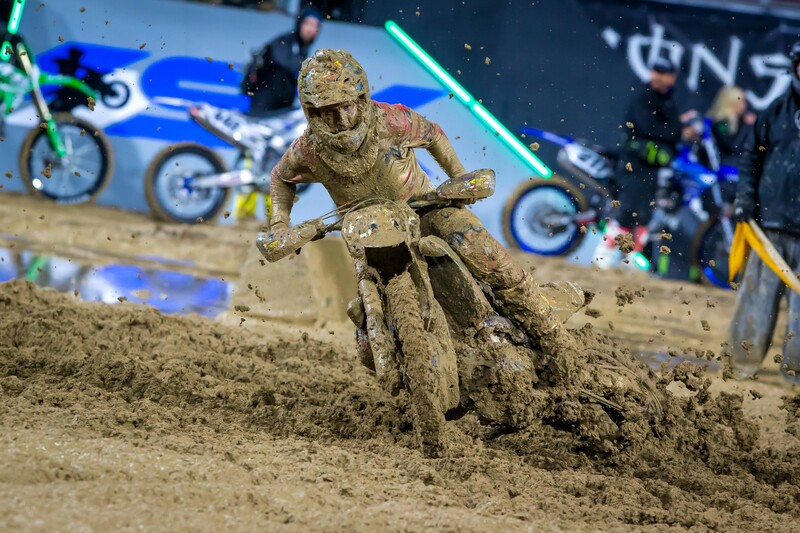 Justin Barcia had a mechanical issue and only finished a couple of laps in San Diego’s mudfest. The entire city of Minneapolis is not hot. With temps dipping well below zero, hot might not even be possible. Enzo Lopes is having a case of the Mondays on every Saturday. Zach Osborne was scheduled back for Minneapolis but will miss another week or two. I mention how cold it is somewhere around 335 times throughout the weekend. The soft dirt needing lime creates a real conundrum. Martin Davalos wins his heat race. Steve Matthes loses his voice telling everyone how great A-Mart will do. Kirk Cousins does an interview during opening ceremonies and somehow throws an interception. Kyle Peters is VERY CAREFUL riding to and from the track (he tore his ACL on the ice last year at this race).